Our new Ultravac® 800 double chamber vacuum packaging machine has been designed for economical, single operator efficiency in a daily use environment where operational simplicity and mid range production speeds are required. The machine’s 10” chamber depth enables operators to handle a wide variety of products from individual steaks and chops to primal cuts. 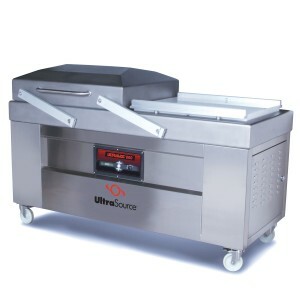 Assembled by UltraSource in the USA and designed to withstand cold, wet, and harsh environments for many years, our new Ultravac 800 machine features stainless steel construction in all major components; four sealing stations with two 31.5” long seal bars in each chamber, which produce 10mm wide band seals to minimize “leakers” and rework; a flat deck design for ease of sanitation; and a NEMA 4 digital control panel that stores up to 10 programs for a variety of products, assuring consistency from cycle to cycle.